Expressed a person at a time. Determined to receive some blessing, hobbled by the experience. Always I’m undone by the laughter—comedic relief. So, love abounds as focus fades in a cruel, satisfying circle. For the demands of children absent daddies. Blame doesn’t work—nothing sticks with this hopeless paste! A key to understand, to investigate. Are we cooking or surviving? Beyond caste and class and race—but it is gone. If you are looking for a provocative book to read, pick up a copy of Cornell West’s book, Democracy Matters: Winning the Fight Against Imperialism (Penguin Books, 2004). West is Professor of Religion at Princeton University. His teaching career includes previous positions at Union Theological Seminary (New York City), Yale University, Harvard University and the University of Paris. You may not agree with West—as a matter of fact, you may argue as you read, but you will be challenged by his thinking. He argues that our national experiment with democracy needs some work. So he talks about the matters of democracy or democracy matters. Clever, huh? 1) The recovery of Socratic questioning and critical, national self-reflection. 2) A rediscovery of and appreciation for the prophetic voice of the ancient Hebrew prophets. 3) An understanding of the "tragicomic" hope in American cultural life as exemplified by the blues and jazz. Read the book. It will wrinkle your gray matter! Very relevant stuff for urban matters. Responsibility to Learn? Responsibility to Teach! I don't normally "cut and paste" content here. But my daughter, Joanna Frazer--a 4th grade teacher in a public school--sent me the essay that you will read below. There has been a good bit of conversation here about "personal responsibility" and the poor. It would be nice if things were always one for one, clean and neat. This essay by Joshua Benton puts a spotlight on a systemic reality about which school children can do nothing. Benton nails one of the major challenges facing urban, public educators. Sometimes it takes an outsider. Something you've seen a thousand times may seem as normal as heat in a Texas summer - until someone new stops in and points out just how wrong it is. That's how I felt when I read an academic paper by Jennifer Booher-Jennings, a grad student at Columbia. Her paper didn't tell me much I hadn't seen repeatedly across the state. But I'd never really stopped to think through the damage well-meaning educators can cause in pursuit of a high passing rate and a good school rating. The bubble kids are the ones who, with a coordinated effort, can be pushed over the passing bar. And pushing kids over that bar is everything in Texas. So how did the educators at this particular school react? By pouring all the resources they could into the bubble kids. The bubble kids get special sessions with the school's reading specialist. The bubble kids get after-school and Saturday tutoring. The bubble kids get small-group attention in class. The bubble kids get extra reading time with librarians and the P.E. teacher. All that's great if you're a bubble kid. That extra time and attention works - those kids usually end up passing TAKS. But what if you're one of the "remedial" kids - everyone below the bubble? You get the shaft. Teachers aren't stupid. They realize they're going to be judged on how many of their kids pass - not how much improvement they can squeeze out of their weakest kids. So they go after the low-hanging fruit: the bubble kids. "I guess there's supposed to be remediation for anything below [a TAKS score of] 55. But you have to figure out who to focus on in class, and I definitely focus more attention on the bubble kids." "If you look at her score [pointing at one student's score], she's got a 25 percent. What's the point in trying to get her to grade level? It would take two years to get her to pass the test, so there's really no hope for her." "If you have a kid who is getting a 22, even if they improve to a 40, they won't be close. But if you have a kid with a 60, well, they're in shooting range. ... Some kids are always going to be left behind, especially in this district, when we have the emphasis on the bubble kids." As one teacher said of the remedial kids: "It's really a lost cause. They must have fallen through the cracks somehow." These are third-graders we're talking about. These kids are getting written off as hopeless cases before they turn 9. Ms. Booher-Jennings only visited one school. But I've talked to dozens of teachers who do some version of the same practice. Principals call it being "data-driven." I call it an excuse to ignore the weak. But it isn't just the weakest students who lose in this system. Bright kids, the ones schools know are going to pass, don't get much attention either. Neither do the special education kids whose scores don't count against the school, or the kids who transfer into a school after October and aren't counted for ratings either. Here's the criminal thing about focusing so much attention on the bubble kids: All it does is make the adults look better. It makes teachers look better when their classrooms' passing rates are posted in the teacher's lounge. It makes principals look better when they get called to a meeting in the central office. It makes superintendents look better when test scores get published in the newspaper. And it makes legislators look good when the statewide passing rate marches up every year. But does it help children when teachers are willing to pour hours into turning a 64 into a 71 - but consider moving a kid from a 31 to a 59 not worth the effort? It's the precise opposite of "no child left behind." I hope every TAKS-giving teacher reading this asks herself a simple question: Is there anything I do for bubble kids that I don't do for weaker kids? And if the answer is yes: How can I justify that? The final irony in Ms. Booher-Jennings' paper comes from one constant among almost all of the teachers she interviewed. They always complained about their colleagues in earlier grades. Those other teachers didn't do enough to prepare these kids when they had them, the teachers argued. Now these hopeless cases are going to lower my passing rate. Gee, I wonder how those kids on the bottom got there? Perhaps if they'd gotten the same attention the bubble kids had, their futures wouldn't seem quite so hopeless. Over the past several weeks, thousands of evacuees from the Gulf Coast have made their way to Dallas. Many more may be joining us in Hurricane Rita's wake. During the first week following Katrina, I was amazed at how quickly the Dallas Housing Authority managed to place people in housing. The operative rule was simple: if you had a housing voucher or public housing in New Orleans, you received it here as well. Our housing authority continues to do a great job of placing families in homes. The bad news is being overlooked. Multi-family housing developers in Dallas have hundreds of units of rental property just waiting for families who have housing vouchers. It is clear to me that the supply currently exists in the Dallas market. The problem is simple: the U. S. Department of Housing and Urban Development has limited the number of persons who can participate in the program. The units are there waiting to be leased. But not enough low-income families are allowed into the program to receive the vouchers to take advantage of the housing. As a result, families are forced to live in sub-standard housing while waiting for their names to creep forward on a local waiting list that currently contains well over 10,000 names. In essence, our new neighbors from New Orleans went to the head of this line, as they should have. At the same time, people already in Dallas will now have to wait longer for housing improvement. Alfonzo Jackson, formerly the CEO of the Dallas Housing Authority, serves as Secretary for HUD. Thanks to his executive orders and to administration policy, the housing voucher program has been frozen and plans for the FY2006 budget envision further cutbacks. Families who possess a housing voucher make rental payments equal to 30% of their income and HUD reimburses property owners the balance. The program allows participants to live anywhere in the community where owners accept vouchers as payment. This approach decentralizes publicly assisted housing while undermining the concentration of poverty that destroys communities. At the same time, the voucher program encourages the development of much-needed, affordable, workforce housing. In short, the program is a boon to developers both for-profit and non-profit. Without the voucher program it is unrealistic to expect developers to continue to produce affordable housing. The poor cannot afford the rents that are required due to production costs. Real estate developers do not build housing to lose money. When housing vouchers are cut back, everyone loses. The program is a great blend of social uplift opportunity that is tied to employment and economic development that harnesses market forces to improve neighborhoods and lives. Housing, like health care, education and employment, is a major determinant of the overall quality of life for people. Poor, substandard housing stock diminishes health, affects educational outcomes and derails economic development. Every dollar invested in community housing is a dollar whose continued circulation improves everything. FEMA now estimates--and this before Rita hits--that 200,000 former Gulf Coast residents are in need of housing. The number is likely much higher and will only rise following the next storm. Trailers--thousands of manufactured housing units to be placed in gigantic campuses. Now, there is a plan. Wouldn't you love to live in that sort of a neighborhood? I read recently that there are 1.1 million apartment units across the South that are available for rent today. I expect that is why the U. S. Senate voted week before last to authorize an emergency expansion of the voucher program for families affected by Katrina. Good move. Now our national leaders need to direct Mr. Jackson to rethink his policy about opening the voucher program in cities like Dallas to people who have been caught up in a different sort of storm for over two decades. Yesterday I spoke in a suburban church--not a particularly wealthy group, a middle class congregation with lots and lots of heart. Since Katrina evacuees began arriving in Dallas about a month ago, this congregation has embraced 34 families. And, I do mean embraced. Each family has been placed in an apartment. Each apartment has been prepared and completely outfitted for living depending on what each family required. The church even gave a baby shower to a young couple whose baby was born last Saturday morning just past midnight! During Sunday School, vans arrived carrying these families to the church. During worship, they filled several pews in the church. The evacuees were incredibly grateful for all that they had received--incredibly grateful. They were obviously very happy to have found this special group of people. Friendships, real friendships, were developing. The church had been transformed by the hard, emotional work of the past month--amazingly transformed. Everyone talked of it. Tears flowed. Those who spoke to the experience talked of how the evacuees had blessed the church far more than the church had blessed them. I expect that this issue could have been debated back and forth for a long time. The evacuees were all from New Orleans. They all happened to be African Americans. The church was a north Dallas County congregation and 99% white. The connections and the fellowship were very real. I truly believe that amazing things will continue to happen in this church with these people working together. The church made it clear again and again that it hopes all of these new friends will stay in Dallas with them. Several of the New Orleans folk with whom I talked told me that they hope to return home eventually. Not surprising really. It was a very sweet experience. But I have to tell you there was a kind of sadness at work as well. The guests from New Orleans were very courageous people from my perspective. Think about how you would feel as a stranger in a new place far from your home. Gratitude would be natural and expected. But, there was also an uneasiness about being only on the receiving end of things. If this has not become clear to the church yet, it will, I promise. During the offering time, I saw many of the evacuees dropping bills into the collection plates. That is a good thing. The church has a real opportunity to build on its healthy compassion and to go further by beginning to commit itself to the work of establishing justice here in Dallas and around the nation. As the evacuees get settled with jobs and schools and life, some of the same issues that they battled in New Orleans will face them again here in Texas. The storm from which they emerged has been raging in their lives for decades. Katrina was the squall that opened and uncovered the world of poverty before the eyes of America. Becoming friends, real friends with the poor could lead to a real commitment to establishing justice, changing the rules and insuring equity for all of our citizens--equality in education, housing, earning power, job training, child care, and nutrition. Jesus once said that "it is more blessed to give than to receive." If that is true, and who would argue that it isn't, then the higher good is to work to the end that all of us can be in a position to give and give again whenever we are called upon to do so. That will include those "washed out" of New Orleans with little or nothing in their hands. My good buddy, Denny Boultinghouse sent the following quote my way last evening. It is a powerful call to travel through life on the path of purpose and power. Philip Yancey, Rumors of Another World ( page 202). I am supporting The Hunger-Free Communities Act of 2005. Congress is now working to finalize next year's national budget. Things have grown more complicated over the past month, haven't they? Two major hurricanes have created major new disaster relief needs and expenses. The war in Iraq grinds on with no end in sight. Back in April, Congress passed a budget resolution calling for a $3 billion budget cut over the next five years to agriculture programs that include the nation's supplemental nutrition efforts benefitting our neighbors who earn the least. This comes at a time when over 1 million additional Americans fell below the poverty line in the past year. More budget cuts are planned for Medicaid (the health resource for poor children), student loans and maybe even the very effective Earned Income Credit. All this comes at a time when the wealthiest 1% of the population will be benefiting from a tax cut plan that will cost us $2 trillion. The Hunger-Free Communities Act of 2005 aims to systematically cut national hunger in half by 2010 and virtually eliminate it by 2015. The bill would establish a grants program for community anti-hunger organizations like the North Texas Food Bank here in Dallas. Annual reporting would be required so that progress or ineffectiveness could be monitored. The bill suggests a really effective local-federal partnership that incorporates the best of public/private leadership and thought. So far there are 98 cosponsors for the bill in the House of Representatives (H.R. 2717) and 25 in the Senate (S. 1120). Most people do not realize that over 36 million of our fellow citizens struggle daily to put food on their tables--13 million of these neighbors are little kids like my grandchildren, Gracie and Wyatt. Our national nutrition programs are the fastest, most direct way to prevent hunger among our vulnerable neighbors. More than half of those who receive Food Stamps (now by debit card) are children. Virtually all the rest are elderly, disabled or those transitioning from welfare to work. Please write your representative in the House and your two senators and urge that they sign on as cosponsors and/or vote for The Hunger-Free Communities Act of 2005. It is just and it is fair and it is right. Embedded in the public-use PC set up for searchers like him. Job. . .anyone wanna job, willing to work? That’s what I’m up to here. . .I need work today. Both shoes and dude. . .ready to work, so young. “I gotta get to work!” I know. Got family here? Walking? Driving? Light rail? This week ran me over. The pace--way beyond my capacity to manage. Appointment after appointment. Opportunity piled on top of opportunity, surrounded by pressing want and no little desperation. I can't write. I can't think. All I can do is keep moving, but I'm wondering at this late hour if any movement is worthwhile. The day just past has been fairly amazing. Impressions. Reflections of things and people and situations I've observed, taken in and engaged. My day began very early. I delivered a speech to about 100 leaders of a major Dallas corporation whose business is to support and supply the construction industry here and across the South. After our time was over, a man approached to ask if we could supply him drivers for his trucks, welders and pipefitters for another part of his business. The jobs come with training, benefits and many, many hours weekly. At noon I spoke to about 100 medical students from UT Southwestern Medical Center. The group had organized itself over concerns to see justice and fairness brought to health care delivery, as well as to other sectors of our national life. For about an hour we talked to one another. I left feeling as if I had been with a group of amazingly bright, young leaders who could change the world. Driving through downtown Dallas, I noticed three women seated outside a Starbucks Coffee store at a table on the sidewalk. Two of the three were in the direct, glaring sun. The temperature stood at about 101. Two of the three were smoking. The city's ban on smoking in all restaurants had driven them outside into the scorching heat. At mid-afternoon I met with several staff leaders (whose job is employment training and readiness) and representatives from a major national corporation headquartered in Dallas. We discussed how to employ our trainees to meet their business needs. The meeting was positive. We left with a real sense of hope. During the meeting, a young man who had been working in our community room in another part of our neighborhood technology center "interrupted" us to remind me to call him if the truck driving jobs materialized. I had mentioned the possibility to him and others prior to our meeting. He apologized for disturbing me and the meeting, but he was so eager to work. He was from New Orleans. New funding possibilities for one or more of our current housing projects. Growing numbers of Katrina evacuees finding us as they get settled in Dallas. The pace can be out of control. I need some rest. Next week it will arrive. I guess I am still reeling this morning. Sunday (yesterday) was an interesting day for me. My thoughts remain somewhat disconnected, but at bottom everything comes together under a heading something like "protecting the interests of poor folks in the city." I suppose I should apologize in advance, since I know that my ramblings will not be received so well by many readers. Yet, I can only come out of my "daily space" and what I experience there. I won't apologize now that I've warned everyone! I'll just ask for indulgence to get my thoughts out where I can continue to work them through. Yesterday began for me in one of the largest, most affluent and "successful" congregations in our city. I'm not kidding when I tell you that there was a long line to get into the sanctuary for the second service of three for the morning. My assignment was to speak to one Sunday School class. The several parking lots were filled with exceptionally "nice" cars--read luxury here. Folks were dressed to the nines. Police were everywhere directing traffic through the amazing jam of cars that is a weekly reality for this church. Wealth virtually oozed out of the pores of the place. It strikes me that this one church could play a huge role in changing the face of Dallas for generations. . .if the focus could change from church to community, from charity to systemic reform, from meaningful reflection to bold and unrelenting action. I enjoyed my time in the class and I shared my observations. Upon arriving home, I learn that funding for the New Orleans and Gulf Coast rebuilding effort will most likely come from cuts to Medicare, health and human services and education. It occurs to me that other programs, already cut to the bare bones, will not escape Katrina's post-landfall knife. The poor in cities all across the nation will be called on to sacrifice for the poor in the Crescent City. Nothing new here. We have seen it happening here in Dallas over the past three weeks. Our low-income citizens have been frozen out of a number of opportunities as Katrina evacuees have gone to the front of several lines. Still, in the aftermath of this terrible storm, I find this bewildering. I also recognize that nothing is settled, But could this disaster be used by ideological "reformers" to further choke our collective response to poverty as a nation? I have seen enough to believe that it is very, very possible. . . no, likely. The escalating cost of war. The escalating cost of a natural disaster. The amazing growth of the urban poor across the nation in every city. Mounting federal debt. No tax increases. Does this really add up? I wonder if we really recognize where the several loci of sacrifice reside in this equation. My son-in-law observed, during a brief visit yesterday, that the next Supreme Court nominee will likely be a person of the extreme right. The resulting hullabaloo will divert our attention from the plight of the poor in our cities. Momentum will be lost and the poor will continue to suffer. I pray that he is wrong about the diversion. I pray that people of faith will keep the spotlight trained on the poor and determine to be deflected by nothing. My eyes filled with tears several times yesterday. Today will be no different, I know. For Most, Work Is Not the Problem. . .
Today I heard it reported again. During an interview with one of the major networks, an official with an inner-city economic development network made a simple, unsurprising comment. "Eighty-nine percent of the people evacuated from the city of New Orleans in the aftermath of Katrina had been employed before the storm," she reported. Her concern had to do with the market opportunities in low-income communities and new economic development. But the statistics line up almost exactly with our periodic surveys of the people who come seeking assistance here at Central Dallas Ministries. Our most recent, admittedly unscientific survey told us that of the people who visit our Emergency Resource Center in East Dallas, 89% are either working, have worked full-time but are now in retirement or suffer from some sort of disability. Of the slightly less than 11% of the unemployed, over half of these folks are between jobs and do not intend to remain without work. Lots of people don't get this. Most poor people--the vast majority of the poor--work. They do not earn enough to make a decent living, but they do work. They don't usually receive benefits, like health insurance, paid vacations, professional training for advancement or retirement plans, but they do work. Anyone who wants to get into the reality of economic and day-to-day family life at or near the bottom needs to comprehend this basic fact of life among the poor. When surveying the people who show up at our door, we always find that in many households there are multiple persons working. Some poor people, as is the case with some rich people, are lazy and don't want to work. But this is not the major problem we face today in our cities. It is clear to me that since the market will not provide adequate wages for these hard-working fellow citizens, the collective expression of the nation's heart must. Government initiatives that reward work need to be beefed up. Work must be a requirement--no hand outs to able-bodied Americans. But the promise of the nation has always been that if one works hard and plays by the rules, a decent, dignified life would be the result. My faith tells me that we must not settle for less than this. We must insure that their work pays off. It was good to hear President Bush on Thursday night call for several comprehensive new approaches to attacking the deeply entrenched and persistent poverty that has plagued the city of New Orleans for so long. His speech correctly linked the multi-generational legacy of poverty to the historical reality of racism and discrimination. The speech was refreshing to me because he recognized, he clearly acknowledged one of the most pressing issues facing the nation today. . .and not just in New Orleans and not just due to a hurricane. Poverty in the world's richest nation, the wealthiest nation in the history of the world, has been on a steep climb over the past 4 years. Since January 2001, millions of our fellow citizens have descended into poverty. In a very real sense, a storm has been roaring across our country for almost a generation. 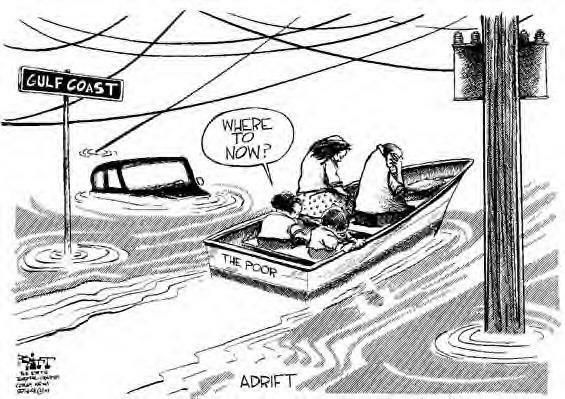 Hurricane Katrina provided the tragic "gust" that uncovered the terrible facts of life for millions of poor people who live in our urban centers, as well as in many rural areas. Possibly this terrible hurricane will bring us a blessing in the long run. Time and national, political will will tell. "Larry, could you offer up your vision of the ideal state of government, companies, non-profits, churches, and individuals working together for a just society? A lot of people seem to get hung up on taxes vs. contributions, and who can be trusted to do what. If you were named President of all of the above groups for a year, what system would you implement to make this country a true land of opportunity? I feel we get glimpses or pieces of this, but never what the whole system would look like, so people are reacting to each idea as it fits in with existing conditions. " I am sure that I cannot provide what Charles is looking for, but the question is provocative. Here's a beginning attempt to provide an outline response with lots of holes and countless unresolved details. 1. Government would go back to serving the people. . .all of the people. We don't need a marginal tax rate of 80% to achieve the basics. At the same time, we need to face the fact that "trickle down, supply side" economics has been a failure, especially in an increasingly one-world economy. So, we don't need our current huge tax cut for the wealthiest Americans. What we need is balance. Funds for public and higher education, housing, universal healthcare, job training, business stimulation and infrastructure improvements (many of the same things the President mentioned in his speech) need to be appropriated to benefit the poor with the understanding that as those at the bottom rise, we all benefit. Work should be rewarded. Low-income persons who do not have the skills necessary to earn a livable wage should be afforded the opportunity to develop new skills. In the meantime, and for those who cannot become more proficient, the working poor should be rewarded for their labor. The Earned Income Credit should be more fully funded and a system for receiving this reward for work should be developed through employers, making it easier to access by workers. Employers who hire low-income workers should be rewarded with economic development stipends or tax credits. Decent, high quality housing should be available for the poor. The requirements for receiving public assistance for housing should include clear and strict accountability standards. Rules should be enforced. Those who violate the rules should not receive the benefits. Supplemental nutrition programs--including the Food Stamp program and the Women, Infant and Children's program--should be expanded and made easier to access. At the same time, we need to recognize that every dollar invested in those at or near the bottom is a dollar that circulates in our common economy. Aiding the poor in their battle against poverty benefits us all. Dollars invested in the poor, in whatever form, are dollars that circulate in the community to the good of everyone. Most of all, the nation needs a consistent public policy that recognizes the systemic nature of our national poverty problem. Laws need to be changed to provide poor people as a class opportunities to rise out of their current quagmire. As a respected friend of mine said to me recently, what we need in this country is a "Marshall Plan" for overcoming poverty. 2. Churches need to recover and, in many cases, discover the message of its own scriptures. Too many spiritual communities operate with a better knowledge of the rules of consumerism and marketing than the Sermon on the Mount or the message of Isaiah. The spiritual leaders of the nation need to develop a prophetic voice and it needs to be heard much more often than is typical. Every church in America that has plans for a new building to benefit its members should set aside at least a tithe of every capital dollar raised to be devoted to significantly addressing the problems of poverty in local communities. The work done by churches needs to be holistic. It needs to include acts of compassion and acts of justice. The church has always been political in this nation. It needs to become political about the poor and about fairness. There are countless approaches and solutions that can involve the church, but the church must rediscover its natural place in this process. The rich legacy of reform and social renewal that characterizes much of our national history has always involved the church. It should again. 3. Business needs to act upon the markets of the nation with savvy, innovation and heart. Someone has well said that the best social program possible is a job. I would simply add a "good job" is what really works. Business leaders understand that robust markets depend upon workers who have earning power. Many business leaders with whom I work are troubled by our current national decline among the weakest of our brothers and sisters. If we ever enjoy a national healthcare system and a solution to the problems facing the uninsured, it will likely be driven by the likes of General Motors or American Airlines who understand the impact of healthcare costs on the entire nation and on their production costs and bottom line profits. Exclusive attention to some corporate bottom lines and the amassing of obscene personal fortunes in this nation through unethical accounting practices and fraud are definitely problematic. But most business people will respond well to coherent strategies to overcome poverty. Government and the religious communities of the nation need to lead the way. 4. Non-profit organizations need to reject the usual rules of a growing "poverty industry" and begin to work as hard as possible to put themselves out of business. This will mean adopting new approaches to old problems. It will mean putting an end to turf battles and competition with other non-profit organizations. It will mean full and complete partnerships in which resources, ideas and opportunities are all shared freely for the sake of a common community mission. Non-profits that want to have a role in renewing neighborhoods will be led by those who love and trust and listen to the poor. The idea of service and salvation will become reciprocal. The poor will be vitally involved in the process of community renovation. Never again will the word "client" be uttered by anyone committed to community development. Entrepreneurial approaches will replace paternalism. When necessary, non-profits will simply get out of the way! One last word. Most of all, we simply need to admit we have been on the wrong track for quite awhile now. Our social policy needs an adjustment. My faith makes that abundantly clear. We've been working very hard to conceptualize and develop high quality, affordable housing for very low-income people here in Dallas, Texas. Predictably, lots of people are not excited about our ideas. We encounter strong resistance from some business interests who believe that single room occupancy apartments simply deepen the seemingly intractable problems associated with the chronic homelessness that is a big problem in our city's central business district. For whatever it is worth, we have in mind permanent, extremely well-done studio type units. Everyone who lives in our development will be a paying customer from some source or the other. Some may lease a home using a voucher. Others will pay rent with Social Security or Supplemental Security income. Still others will be veterans and will satisfy their rental requirements by using those benefits. Some units will be paid for by earned income. "So, is your project going to house homeless people, Larry?" someone always seems to ask. "Well, I guess it will if you mean people who might be homeless if we didn't develop our property," is an answer that is not completely satisfying to me. A better answer is really no answer at all, but a question back to whomever asks me next. "I'll answer your question, but first you must answer mine. What do you call a formerly homeless person who gets a home?" is what I intend to reply next time. I call that person a neighbor, a tax-payer, a fellow-citizen, a wage-earner and a valued human being. Of course, in every instance that is exactly what currently homeless men and women are before they find homes in which to reside off our streets! Somehow "homeless" has become an inescapable stigma. Let me add one more thing. Lots of people post on this blog. Lots of people have ideas about who should do what and who shouldn't. Many have strong opinions about what the church should do and how business can help. All of this is stimulating and wonderful. But we need to remember that there comes a time to simply act. To be quiet and go to work. I've discovered that when you do that, the true colors of individuals, organizations and institutions are clearly revealed. We're going to build fine studio apartments. Our target market is at the very bottom. It will be hard. But we will achieve our goal and we are open to working with anyone who wants to move past conversation to real work. . .for the sake of an important group of our neighbors and for the economic well-being of our city (more on this aspect of the challenge in a later post). Yesterday over 150 families lined up to receive assistance in our Emergency Resource Center here on Haskell Avenue in inner city East Dallas. People, most of whom are working, come to us every day seeking aid. It is a national shame. Almost every family has at least one person working--most have more than one person working in the family units who come to us at Central Dallas Ministries. The problem is the wages that people are able to bring home are not sufficient to sustain life for families. The story is the same every single day. "Yes, I have a job," people tell us. "I make $9.50 an hour," a man reported recently with a measure of self-assurance. Could you live on $19,760 gross annually? The problems will not go away. What we need is a national initiative to conquer poverty, while no longer blaming the poor. Education, health care, housing, nutrition and hope are needed now as never before. Where is the voice of faith? Benevolence committees won't get the job done. An ideology informed by faith is required. It is past time for action. We have plenty of options as citizens of faith living in a democracy. Last week I spent two long days with a wonderful group of people walking from one side of the Capitol building in Washington, D. C. to the other. Converging on the Capitol from seven states, our delegation represented a creative new initiative--the National Youth Apprenticeship Collaboration. Our partnership seeks earmarked funding to deliver high-quality, hard-skills trades development to low-income persons ranging in age from 18 to 35. A number of options are built into the strategy, including transportable trades certification and a BS degree in construction science from Hampton University and other partner colleges and universities. Providing training in building trades such as plumbing, carpentry, electrician services, H/AC engineering, foundation construction and computer aided drafting, to name a few, will place students in position to earn not only a livable wage, but an appreciable wage. In addition to federal funding, the collaboration has signed on with the AFL-CIO. The trades unions involved will open apprenticeship positions to students, each of whom will be paired with a skilled worker. During pre-apprenticeship and apprenticeship stages of the training, students will be paid a stipend for their work that will allow them to remain in school until they achieve their educational goals. Private business groups are also on board. Wachovia Bank and Coca-Cola have committed financial backing as the program rolls out and grows. No doubt, other corporations will join in. U. S. Representative Cynthia McKinney (D-GA) has led the charge in the U. S. House of Representatives. Senator Mike DeWine (R-OH) is a big backer in the U. S. Senate. When our Congresswoman, Eddie Bernice Johnson, learned of the effort, she quickly advanced Central Dallas Ministries as a partner for the collaboration from Texas. Groups from Georgia, Virginia, Florida, Ohio, Alabama and California are also signed on to work in the national effort. As we moved from office to office in the Congress, we enjoyed great conversations with both Republicans and Democrats. NYAC provides a great example of how community-based, faith-based groups can successfully partner with private sector industry and business groups and government to develop scalable models for attacking poverty at its roots. All of the partners in this coalition are needed to make it work. Remove any of the representative constituencies and the initiative just doesn't fly. The community-based groups, motivated by heart and faith, deliver and support the students. The trades industry provides the training for work, as well as jobs. Business and government offer up the funding that promises great return on investment. The outcome will be trained tradesmen and women. And, you know what? You can't outsource plumbing! The storm that crushed the poor in New Orleans began gathering power long before the Labor Day weekend of 2005. What many people still don't quite understand, and what some refuse to acknowledge, are the forces that were at work in New Orleans that helped create a large and expanding underclass in the city prior to the long-dreaded "perfect storm." Tourists seldom saw this side of the Crescent City. The "city that care forgot" had become the city that forgot to care, at least for its weakest, most vulnerable residents. It is as if the Katrina "blew the cover" on one of our most pressing national problems in a city where everyone loved to go for a good time. Corruption at about every level in political processes affecting the city, twenty-five years of radically conservative federal public policy, class segregation, unchecked economic forces that drove the widening gap between rich and poor and a fatal resignation on the part of the poor themselves combined to doom the city to a full-scale disaster upon the arrival of Katrina. I expect the city will come back, at least to some extent, even if not completely. Those with material resources, personal and social options and the connections guaranteed by education, status and privilege will rebound as well. The poor are another matter altogether. Cities across the nation have moved through similar dynamics since the late 1970s. The poor have been the biggest losers in terms of outcomes. Cutbacks in spending for programs that lift and benefit the poor have had major impact on urban areas. The number and percentage of poor people in America have continued to increase steadily year by year--with the exception of a brief rebound during the mid to late 1990s. Since this time last year, over 1 million additional Americans dropped below the poverty line, most live in urban areas, with the end of this tragic and needless slide nowhere in sight. Housing? Funds directed to assist the poorest of our neighbors continue to be cut back. In Dallas there is an over supply of housing whose owners are willing to accept vouchers as payment for rent. The continuing problem is that there are no vouchers available to our poorest residents. Education? The rhetoric sounds nice, but many federal mandates remain unfunded. The middle-class continues to exit the city. The poor are left to fend for themselves. Teachers teach to standardized tests. Urban students drop out, fall further behind and simply give up. Our state legislature cannot come up with a workable school finance bill. Pell grant awards are smaller these days for college students who need financial assistance. Tuition is up across the nation in public universities. If education is a key to moving out of poverty, the poor are having a harder time than ever before obtaining the instruction and training they need. Health care? Analyze the federal cutbacks and you will see who suffers the most. Surprise: the poor--along with that shrinking number of physicians willing to care for them. Mental health services? Funding cuts have been steady and continuing with no end in sight. Persons suffering with bi-polar disorders, dual diagnosis challengens or schizophrenia and who are poor, basically find themselves on their own. Basic human services, including case management, employment training, food supplements, child care? Cut, cut, cut. It would be downright funny, if it weren't so tragic, to contrast the on-going complaints about "welfare" spending with the reality that such spending is almost gone compared to 1995 levels. Almost 1 in 3 residents of New Orleans lived below the poverty level when the storm stuck the city. Fully half of the citizens were either poor by the federal definition or just above the line. No doubt, some of these folks had made mistakes and decisions that contributed to their impoverishment. But bad decisions cannot possibly explain the depth of the city's poverty. Now tens of thousands of former New Orleans residents are scattered across the nation. Over a quarter million now live in Texas. This exported poverty will challenge other American cities like Dallas that already have many of the same problems at work on and among the poor. Public and private sectors must come together to restore hope. New doors of opportunity must be opened to the urban poor. Our failure to respond to the increasing burden of the poor will only continue and intensify the storm that we've witnessed in the past several days. Make no mistake, people who live in low-income neighborhoods in this country care about crime and quality of life issues. As a matter of fact, the vast majority care about all of the same things that people residing in more affluent communities care about, including good schools, crime prevention, code enforcement, timely trash collection and the timely delivery of health-enhancing community services. I know the common perception is quite different, but it is simply not true. Fifteen years ago or more, when I was still a pastor, our church partnered with a small church located in a very poor, South Oak Cliff neighborhood here in Dallas. What a great partnership it was for everyone involved, especially me. Rev. L. J. Pate served as pastor of the congregation and leader of the neighborhood. He is still my good, good friend. Working in his community revealed many things to us. First and foremost the connection we enjoyed there showed us that what I have said here is true: our friends from the Gladewater community desired the same things we all desired for ourselves, our families and our neighbors. But, we also learned that this part of town often didn’t receive the same kind or quality of service from the public sector as we did out in much more well-to-do Richardson. Police protection and patrols, garbage collection, infrastructure maintenance and drug enforcement simply did not measure up to the standards our group was accustomed to. I recall the anger and indignation on the part of our members as they realized how their new friends were living without much prospect to change things. Poor people don’t generally live in areas with high tax bases! And, to their own hurt, poor people don’t tend to get organized, vote or act as unified blocs demanding change like people in other parts of town seem to always operate. The recent images of looting from New Orleans in the aftermath of the Katrina tragedy may deceive us in terms of truly understanding the hearts of the poor who dwell in our inner cities. We must resist the temptation to lump people into neat, tidy categories so that we can dismiss them and our civic responsibility to and with them. On Thursday, August 25, just few days before Katrina struck New Orleans, I attended a community meeting with friends who live in a public housing development in a poor part of the city. The large community room in the center where we met was jammed packed. Representatives from the Dallas Police Department were present. Members of the development’s Residence Council were present. Many, many concerned residents attended. For almost two hours over lunch, this dynamic group had an in-depth discussion about how they all could work together to make their community better, safer and healthier. They also were clear in insisting that public services be delivered to them and to their community in the same way they were being delivered elsewhere in Dallas. Don’t dismiss the poor as unconcerned or unthinking. Open your mind and heart to the reality that when it comes to basic human needs and hopes, we really are very much the same. Frankly, it is my opinion that until we arrive at this understanding, our urban areas will never be appreciated or taken seriously as the precious assets that they actually are. About all that matters in life is love and pain. At times these two primary realities of life seem to be involved in an amazing, perverse, sickening, exhilarating, meaningful dance. Love allows space and motive and hope and purpose for overcoming, managing, surviving, providing purpose for pain. If you have a trained and keen eye, you'll observe the production when you watch your nightly news. It is there every time. Someone is in deep pain. Someone is responding with love. We have "enjoyed" a primer on this mysterious and universal relationship during the past week as we have watched the Gulf Coast disaster. I experienced it all day yesterday. Joining a national collaboration, I worked in and out of various congressional offices in Washington, D.C., promoting and lobbying for a employment training initiative that will make a substantial difference in the lives of those who enroll. Some will be survivors of the Katrina. The effort we were promoting will attach students to a construction trades craftsman as apprentices. While learning hard, marketable construction skills--plumbing, electrical, heating and air conditioning, carpentry--these students will be paid a livable wage. At completion of the training regimen, they will receive certification in a trade that will provide income in a range between $18 and $35 an hour. My partners were drawn together by Congresswoman Cynthia McKinney of Georgia. I listened as she addressed C-Span and the House of Representatives last evening. I was inspired. In sharp contrast, I witnessed the speaker for the evening gavel her to silence in anger the moment her time was up. She spoke clear truth to power. She spoke out of her pain and because of her love. It was a triumphant speech about the growing number of poor people in America. The team of people from across the country were unaffected by the behavior of the congressman who presided over the House session. They know pain as a partner. Their love transcended the momentary pain--it moved us all along. We didn't miss a beat. I saw lots of pain as I walked to dinner after a long day. I love going to Old Ebbets Grill in the heart of DC--my favorite joint in the city. Homeless people sleeping on the streets of the capitol of the richest nation on earth. I sat down outside the restaurant to buy a shoe shine from a street vendor. Here is a guy with a degree in accounting and a Marine Corps purple heart from Vietnam. We enjoyed a great conversation. He hopes to open a real shoe shop by spring next year. Just two guys enjoying the evening and connecting. Both of us have known and know pain. Both of us have great capacity to love. Life is all about discovering how to live out of that love in the face of human pain. Lots of people in this nation reside in a space defined by denial. Pain kicks the life out of denial, if you can reach the place where it touches your heart and soul. Love not only makes sense out of the experience of pain, love delivers us, connects us and allows us to live with meaning. "I was in prison and you came to me. . . "
A friend of mine awaits his release from a Texas prison. Most of my other friends have no experiential or personal context for understanding him, his current circumstance or the life that led him to the Texas Department of Corrections. Richard ended up in prison. But, that is only the beginning of his story. He and I have been exchanging letters for a couple of years now. He appeared before the parole board recently. He hopes that they will decide in his favor and send him home. Before landing in prison, he was a member of the small, urban church that I have attended for the past eleven years. Since being in prison, he has applied himself to just about every opportunity presented to him. A few days ago I received his latest letter. Since there is no way to convey what his life has been like, I want to share the words he wrote, exactly as he wrote them. My intention is not to embarrass or exploit my friend. My purpose is to open a bit of a window into a world and a life about which most people have absolutely no understanding. "I am Praying that my letters fine you and yours in God hand. And also would you tell Everyone at the Church Hi"for me. and to keep me in pary. I did see Parole on the. 8-17-05 I will let you all no, when I her back from them, hope I make it, I am so tide of here but. If not let it be not my will but, God' will, I ask Tom to let the church no, I have not got A. letter from hem and some time. Bonnie's sister had sade in her last letter to me. That our church had move. to Washing St. and I didnot" Hav the new address. "This is Just Some of my award." Enclosed in my letter were three certificates my friend had been awarded for completing various training programs designed to help him learn to read and write. My friend has many, many needs. In my view he needs to be in a place where he can receive treatment for his addiction, a better setting for basic adult education and practical training that will lead to productive employment. Jesus once told his followers that when they visited folks in prison, they were in essence paying him a visit. I expect that if Jesus was here today, he would say the same. Given the blessings of our democratic institutions, surely we have options besides the traditional, no-treatment, no-change prison system that has become an industry for rural America. Taking people like Richard out of the community hurts all of us. Surely there must be a way to provide what he needs, seriously address his failures and at the same time avoid the incarceration that costs all of us far too much with too little return on our investment. Richard will be home soon. I look forward to seeing him and hanging out again. I pray this time that he can "stay out" like he plans. Yesterday I spent most of the day working out at the corporate offices of the Dallas Housing Authority. My job, and that of other volunteers from the Central Dallas Ministries community, was transporting families to their new dwellings here in Dallas. Any victim of Katrina's wrath who received public housing assistance while living in the storm's path was entitled to receive the same assistance here in Dallas. I spent most of my time observing things and talking to the people who were waiting patiently to be interviewed by DHA staff. One of the most encouraging things that I witnessed was the work of Ann Lott. Ann serves as President and CEO for the entire housing authority in our community. I watched as she stood in the midst of the crowd for hours talking to people, eyeball-to-eyeball, about their needs, their pain, their loss and their hope. Talk about leadership! In discussing the transportation needs of the people before the day began, she told me, "Larry, just jump in and join the chaos!" She could have said "chaos of concern," because that is exactly what she was managing as she led the way for the entire team without a word. Ann Lott is no bureaucrat. She stands among our community's finest servant leaders. Dallas is fortunate to have her leading its housing authority. I enjoyed a number of conversations with people who had survived the ordeal of Katrina in the city of New Orleans. One with a woman whose family had managed to escape the flood waters and make it to Dallas. As she was completing paper work to lease her new residence, I mentioned that now we needed to gather furniture and other household items that would be necessary to “make a new home” here in Dallas. My other unforgettable visit was with a gentleman, accompanied by his wife and two children. They were looking for permanent housing as well. He described with frustration how he had lost everything. He hung his head as he told me of the babies he had seen floating in the flood waters. He had worked in New Orleans all of his life, for the past 13 years in a fish market. “We made it through only by prayer and sticking together,” he said. I pray that he is correct on both counts. He and his wonderful family do have a ways to go. But, they will be okay, if we all stick together and keep the faith. Today will be another busy, tiring day for thousands who get on with the work of settling here in our city. Thousands of volunteers and public servants will assist in the effort. The response of both newcomers to Dallas and of all those who greet them has been amazing and inspirational to watch. Shopping at more than one store for supplies over the weekend, I discovered that the shelves had been cleaned out by compassionate people who got their first! The months ahead will be filled with major challenges as folks attempt to find jobs, set up homes, educate their children and get on with life. Today is gratifying to watch, even as we continue to mourn the situation in New Orleans with so many dead, confused and lost. Today will be a time of coming together around a common mission. May we have the courage and strength to carry on beyond these first, critically important days. The vast majority of low-income persons in America today want to work, are working and seek to improve their employment status in order to work more profitably. CDMWorks is one of our busiest "departments" here at Central Dallas Ministries. We have developed a number of fairly creative initiatives to assist people in deciding what they want to do and then in staying with them until they enjoy a bit of "traction" on the road they choose. We work with employers to determine exactly what sort of employees are needed in different industries and companies. With this information we design training programs to meet the needs of our partner companies. The results have been encouraging. Our weekly "Employment Circle" classes form the backbone of our employment efforts. These weekly gatherings help us identify people who are serious about work. It is amazing, inspirational and informative to listen in on these groups. The students that I have observed across the last several years desire more than just about anything else to learn, to improve and to grow as effective workers. Here on the corner of my desk is our most recent promotional flyer for our Employment Circle. The headline tells it all: "Looking for a job? Looking for a career?" Tomorrow morning at our technology center down on Hall Street, just across the street from the Roseland Homes public housing development, I know what will happen. I won't even have to call for an official report. Our training classroom will fill up by the 8:45 a.m. start time with folks eager to get on with their next steps toward a better life for themselves and their families. This is the constant that I have observed across the last several years. People want to work. Improving skills so that working people can earn enough to making a living--that is the real challenge today. Some of our students face real challenges. When he came to CDM last May, he had been living in the Union Gospel Mission for over a year and had not been working. During the class sessions and in his homework times, he worked on various employment tools, including his resume, his overall spirit and his skills. Just this month he landed a job with Star Concessions at DFW Airport. The position is not his end-game, but he is back on his feet and moving! She does not speak English fluently, but she is working on it. She worked hard in our Employment Circle and was hired by a former Employment Circle trainee who is now a manager at the Wyndham Anatole Hotel. Her report back to us is clear: "I am very happy!" People keep showing up every week. People want to work. Poor people want to work. No doubt, many of our future students will be our new neighbors here in Dallas who've come to us from New Orleans. We will eagerly welcome them. And they, like the neighbors with whom we have been working already, will be eager to work. We will do our best to get them ready for re-entry into the workforce. We will do all that we can to prepare them to command the highest hourly wage possible. We will stick with them after they are employed to provide them friendship and support. It's what community is all about. So many people have been calling to ask what Central Dallas Ministries needs in the aftermath of Hurricane Katrina. Already we have seen scores of families who have made their way to Dallas. We anticipate that our busiest days will be in the weeks ahead as these families move into apartments and houses of their own. We will be helping the Dallas Housing Authority transport families to these homes. The apartments we own and operate that are vacant, though only a few, will also be available to these folks. Most likely we will be helping these families get "set up"for living in Dallas. Not everything is completely clear, but we will respond however we are asked. Cash donations will also be welcomed as we prepare for the long-term upswing in demand for all of our services. Please make checks payable to Central Dallas Ministries, mark "Katrina" and mail to CDM, P. O. Box 710385, Dallas, Texas 75371-0385. My buddy, Tommy Goode, Executive Director of City Core Initiative (www.citycoreinitiative.org, the website to be launched by mid-September) sent me a page from the Bruderhof community's web page and blog. If you don't know about this amazing, historic community, it will be well worth your time to check out their site, their history and their resources at http://dailydig.bruderhof.org/. Only when we take human existence upon ourselves in its starkest and most humiliating misery—a misery in which nothing has meaning—can we win through to the only possible way to live. Only when we taste the lot of all, when we become involved deeply in world suffering, one in heart with the need of humanity, can we win through to our true vocation. Only when the conscience becomes active, only when love is born out of suffering, only when hardship leads to liberating action, is victory near. Seems to me a fit meditation for this day. Many people, especially rather pale people of my complexion, don't like to talk about race and its meaning in America today. Hurricane Katrina provides ample context for recognizing this once again. The entry is quite, well. . ."interesting." What you will see are two photographs. The first is of a young black man with a garbage bag. He is making his way through chest deep water. The caption under the photo reads, "A young man walks through chest deep flood water after looting a grocery store in New Orleans on Tuesday, Aug. 30, 2005. Flood waters continue to rise in New Orleans after Hurricane Katrina did extensive damage when it made landfall on Monday (AP Photo/Dave Martin)." The second photo captures a young white couple wading through water of similar depth. The caption under this second photo reads, "Two residents wade through chest-deep water after finding bread and soda from a local grocery store after Hurricane Katrina came through the area in New Orleans, Louisiana (AFP/Getty Images/Chris Graythen)." I am sure there will be all sorts of "rational" explanations for this amazing contrast. Don't kid yourself. Race still matters in this country and it matters a lot. What might have happened in the aftermath of Katrina if. . .
. . .on Tuesday, the President of the United States had ordered an immediate deployment of a minimum of 50,000 military troops, with a full complement of amphibious crafts/vehicles, into the city with a verbal commitment during a television address to the entire nation to order as many more troops as proved necessary? . . .on Tuesday, the President of the United States had showed up in New Orleans, as he did in New York City after 9/11, to lift the morale of the city by holding the people and wading into the flood waters? . . .on Tuesday, the President of the United States had called for a high level conference on solutions that included all cabinet members and experts from Florida who endured Hurricane Andrew? . . .on Tuesday, the military had deployed tens of thousands of life rafts in the water logged neighborhoods so that people could have saved themselves from the flood waters? . . .on Tuesday, hundreds of Greyhound buses had been ordered to the city to evacuate the refugees who had been too poor to leave the city in the first place? . . .on Tuesday, the Chairman of the Joint Chiefs of Staff had ordered abandoned military bases all across this nation to be opened and readied to receive the refugees from Katrina? . . .on Tuesday, the President of the United States and the White House Office of Community and Faith-Based Initiatives had called on every church, synagogue, temple and mosque in America to prepare to minister to the former citizens of New Orleans who would shortly be arriving in their various communities? . . .on Tuesday, every major media outlet in America had called for immediate action from every sector of government--city, county, state and federal--to come to the aid of the drowning city? . . .on Tuesday, FEMA and the President of the United States had guaranteed adequate support for local law enforcement officials to do their job in New Orleans? . . .on Tuesday, a priority one effort to evacuate the hospitals of the city had been undertaken? . . .on Tuesday, the Corps of Engineers had been directed by the President of the United States to spare no effort nor worry about any expense to begin to develop a strategy to restore the levees in the flooding city? . . .on Wednesday, every resource needed in terms of rescue and security had been directed to this city in danger of dying? . . .on Wednesday, FEMA had negotiated relocation agreements with 25-30 cities across the entire nation to receive with dignity the refugees from New Orleans? . . .on Wednesday, the President of the United States had declared martial law and directed the federal government to take over the management of the city of New Orleans? . . .on Wednesday, the federal government had dropped in adequate food supplies at the Superdome and in other extremely distressed parts of the city? . . .on Wednesday, the Secretary of Transportation and the Secretary of Commerce at the direction of the President of the United States had ordered that gasoline prices be frozen at $2.75 per gallon? . . .on Wednesday, the Secretary of Housing and Urban Development had opened Section 8--now called the Housing Voucher Program--benefits to refugees from New Orleans to any city or town into which they resettled? . . .over the past two plus decades, the various Presidents and Congressional delegations had heeded the pleading of the New Orleans' representatives to help with funding the strengthening and rebuilding of the levee system in the city? . . .today the politicians vowed to stop asking people to be patient with the heat, the hunger, the thirst, the death and the despair? Please pray for this amazing city and its tortured people. Hurricane Katrina ravaged the poor. Almost 30% of the population of New Orleans lived below the national poverty line before she hit. As is usually the case, the poorest citizens in the city lived in the worst places in terms of vulnerability to a storm like Katrina. Compounding that reality is the fact that the poor couldn't leave the city. Many chose not to leave their homes. Undoubtedly, most of the loss of life will be among the poor. "It's just a thing that always happens. The ones that has the least, get hit the most." The people hit the hardest already were burdened with extreme circumstances on a daily basis. Few truly accessible healthcare options. Isolation from the larger community of opportunity. Segregation by class, as well as by race. The problems on the ground in New Orleans before the storm only complicate the situation there today. Again, according the ABC News--are you ready for this?--over 700,000 people in the Gulf Coast region live in mobile homes. Katrina should serve as a wake-up call to the nation concerning the on-going plight of the poor in America. The most vulnerable among us live fragile lives. Things could be so much better. Our weakest citizens could actually be so much stronger than they are today. But we have lost our national will to attack poverty and to overcome it. We've opted for an approach that simply cuts people loose to manage for themselves with few resources and limited options. Then, when a relative handful are successful against great odds, we crown them poster children for the "American Way," forgetting the 99% who never have even a chance of making it out of such crushing poverty. Only when disaster strikes do we mount efforts to intervene, often when it is too late to save the unnecessary loss of life that always seems to occur. For years now on the annual National Day of Prayer, we have quoted the famous call and promise recorded at 2 Chronicles 7:14. The promise is taken from a recounting of the dedication of Solomon's Temple. It was written during the post-exilic period, possibly by Ezra, sometime between 450 and 400 BCE. It is interesting that people during the time of Ezra dealt with many problems associated with justice, fairness and the rebuilding of a nation. Normally, when we read these words as a call to the nation to pray and seek the guidance of God, we link needed national repentance to sexual sins and the fear associated with immoral media, a lack of religious expression in the public sector, etc. Politicians and preachers take to the stages of America to pray and to pronounce. The following day the poor continue to suffer. Just once I wish we were honest enough to link this call and its promise to our out-of-control materialism, to our systemic national injustices and to our failure to care for the weakest among us. Such an emphasis would certainly move us much closer to what the writer of the passage had in mind.